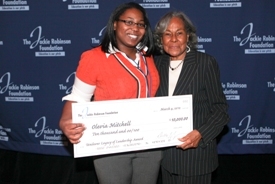 Syracuse University’s Olevia Mitchell, a junior in The College of Arts and Sciences, has received the coveted Unilever Legacy of Leadership Award at the Annual Jackie Robinson Foundation Mentoring and Leadership Conference held in New York City March 3-6. Established in 2003, this $10,000 award can be used towards tuition or a charity of choice toward furthering a community service initiative. In addition, the scholar is offered candidacy for a domestic internship at Unilever. In 2008, Mitchell created the Neighborhood Action Council, which engages youth in her community to improve their neighborhood by promoting healthy activities as an alternative to the norm of gangs and truancy. The economics and psychology double-major at SU also created two murals in her community, bringing empowerment and ownership to her peers through art.